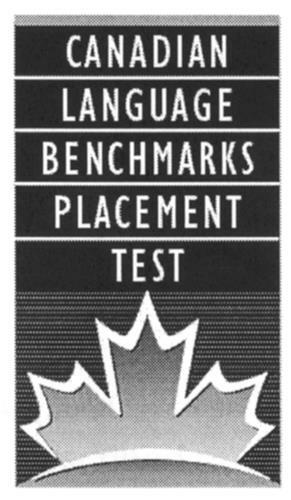 On Wednesday, July 30, 2003, a canadian trademark registration was filed for the above pictured logo by Centre for Canadian Language B 200 Elgin Street, Suite 803, Ottawa, ONTARIO, CANADA K2P1L5. The Canadian IP office has given the trademark application number of 1186029. The current status of this trademark filing is Registration published. The correspondent listed for is GOWLING WLG (CANADA) LLP of SUITE 2600, 160 ELGIN STREET, OTTAWA, ONTARIO, CANADA K1P1C3 The trademark is filed in the description of Printed training materials, namely, books, booklets, guides, charts, manuals, instruction sheets; printed training materials for standardized test administrators, namely, books, booklets, guides, charts, manuals, instruction sheets, sample tests; pre-recorded videos in the field of standardized testing; pre-recorded audio cassettes and audio compact disks for the administration of standardized tests; printed matter for the administration of standardized tests, namely, tests, scripts, logs, storyboards, photographs, forms, answer sheets. , Arranging for and providing training to standardized test administrators; certifying standardized test administrators; overseeing the administration of standardized tests; preparing, administering and scoring of standardized tests; educational testing; standardized testing; English language communications skills testing; testing in the field of English as a Second Language. , On-line services for standardized test administrators, on-line services in the field of language skills testing, providing a communications forum over the global computer network for standardized test administrators, providing a communications forum over the global computer network in the field of language skills testing, providing information and guidance for standardized test administrators, providing information and guidance in the field of language skills testing. .
(1) - Printed training materials, namely, books, booklets, guides, charts, manuals, instruction sheets; printed training materials for standardized test administrators, namely, books, booklets, guides, charts, manuals, instruction sheets, sample tests; pre-recorded videos in the field of standardized testing; pre-recorded audio cassettes and audio compact disks for the administration of standardized tests; printed matter for the administration of standardized tests, namely, tests, scripts, logs, storyboards, photographs, forms, answer sheets. (2) - Arranging for and providing training to standardized test administrators; certifying standardized test administrators; overseeing the administration of standardized tests; preparing, administering and scoring of standardized tests; educational testing; standardized testing; English language communications skills testing; testing in the field of English as a Second Language. (3) - On-line services for standardized test administrators, on-line services in the field of language skills testing, providing a communications forum over the global computer network for standardized test administrators, providing a communications forum over the global computer network in the field of language skills testing, providing information and guidance for standardized test administrators, providing information and guidance in the field of language skills testing.